It’s the 50th anniversary of Mr. Rogers Neighborhood. The heart swells twice its size at the news. 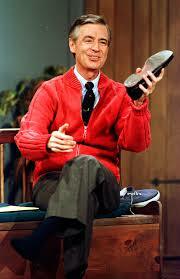 As a child I was soothed by Mr. Rogers voice and believe the man played an integral part in my love of cardigans. I, too, have a collection donned when I find my way back home. I forced my wee chickens to watch, if only to give them a half hour of slow down. Change your shoes, put on your sweater and feed the fish. Settle in to learn to be a better human. I think I’ll make a snappy new day. Try to get that song out of your head.